Sometimes a simple idea can yield fantastic results. A few runs of LED strips fastened to a black hoody and sweatpants and just like that…a LED stick person costume for Halloween. The creator of the “Glowy Zoey” [Royce] originally put together some glow in the dark stick person suits to stand out when hitting the slopes at night. Now he’s taken that simple idea for a costume and made a small business out of it. The suits themselves consist of button snaps and ribbon loops sewn into a pattern that routes the LED strips around the jacket’s hood and down each arm. To make the lighting effect pop, an all black plastic mask is used to cover the wearer’s face. It wouldn’t be that much a stretch to substitute EL wire in place of the LED strips if one were so inclined. We’d wager a number of you could pull this off straight out of the junkbox. [Eric Strebel] is quickly becoming a favorite here at Hackaday. He’s got a fantastic knack for turning everyday objects into something awesome, and he’s kind of enough to document his builds for the viewing pleasure of hackers and makers everywhere. It also doesn’t hurt that his voice and narration style gives us a real Bob Ross vibe. The latest “Happy Accident” out of his workshop is a neat light-up cane made from a ceramic skull found at a local store. But while the finished cane itself might not be terribly exciting, the construction methods demonstrated by [Eric] are well worth the price of admission. Rather than using Bondo like the filler we’re all accustomed to, he shows how it can be used to rapidly build free-form structures and components. After building up layers of Bondo, he uses a cheese grater to smooth out the rough surface and a hobby knife to clean up the edges. 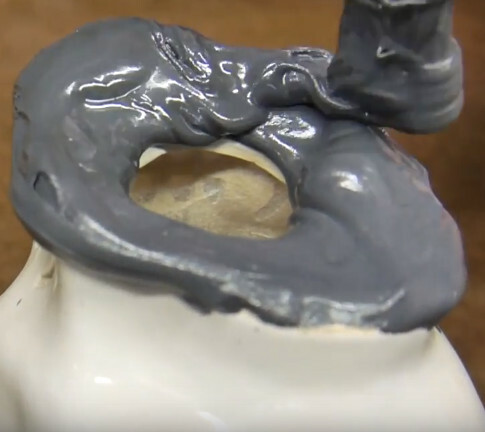 According to [Eric], one of the benefits of working with Bondo like this is that it’s very easy to shape and manipulate before it fully hardens; allowing you to really make things up as you go. [Eric] also shares a little secret about how he makes his gray Bondo: he mixes some of the toner from a laser printer cartridge into it. This allows you to very cheaply augment the color of the filler, and is definitely something to file away for future reference. If the video below leaves you hungry for more [Eric Strebel], check out his fantastic series on working with foam core, which should lead you right down the rabbit hole to his DIY foam core spray painting booth. This year for Hallowe’en, [Scott] went out dressed as a Comcast xfinity hotspot. Funny, yes, but there’s a deeper meaning here. [Scott] really went as a walking PSA that illustrates the dangers of making assumptions about the relative safety of WiFi networks based solely on their broadcast names. [Scott] could have gone chaotic evil with this setup, but he didn’t. No one could actually get on the Internet through him. Inside the “hotspot” are a Wi-Fi adapter and a Pi Zero running a captive portal. It broadcasts the default ‘XFINITY’ and ‘xfinitywifi’ SSIDs, plus a bunch of other common network names. Whenever anyone tries to connect, or worse, their phone automatically connects, they’ll hear a sad tuba cadence. This comes courtesy of a multi-sound effects box that’s controlled by the Pi through a relay board. Meanwhile, the mark’s device is redirected to an internally-hosted “xfinity” login page. Anyone who actually goes on to enter their login credentials is treated to a classic horror film scream sample while the evil hotspot quietly stores their name and password and displays them on an e-ink display for all to see — a walking e-ink wall of sheep. Check out the demo after the break. [Scott]’s evil hotspot is powered by a huge battery that can run it for 24 hours. Here’s a wind- and solar-powered WAP we covered several years ago. We’re pretty sure that [Luke] took Uncle of the Year last Halloween when he made an RGB LED princess dress for his niece. He recently found the time to document the build with a comprehensive how-to that’s just in time for Halloween ’17. [Luke] made the system modular so that his niece could use it with any dress. The RGB LED strips are actually fastened down the inside of a petticoat — a fluffy, puffy kind of slip that’s worn underneath the dress. The LEDs face in toward the body, which helps diffuse the light. [Luke] first attached the strips with their own adhesive and then spent a lot of time sewing them down so they stayed put. At some point, he found that hot glue worked just as well. The coolest part of this project (aside from the blinkenlights of course) is the power source. [Luke] used what he already had lying around: an 18V Ryobi battery pack. He wired a step-converter to it using a printed cap from Shapeways that’s designed to connect metal clips to the battery contacts. This cap really makes these packs useful for a lot of projects that need long-lasting portability. These batteries are rated for 240W, which is overkill considering the load. But there’s a reason: it keeps heat to a minimum, since the electronics are hidden inside a cute little backpack. Speaking of cute, you can see his niece model the dress after the break. Halloween may have come and gone, but [Luis] sent us this build that you’ll want to check out. An avid Walking Dead fan, he put in some serious effort to an otherwise simple bloody t-shirt and created this see-through “stomach shot” gunshot wound. The project uses a Raspi running the Pi Camera script to feed video from a webcam on the back of his costume to a 7″ screen on the front. [Luis] attached the screen to a GoPro chest harness—they look a bit like suspenders—to keep it centered, then built up a layer of latex around the display to hide the hard edges and make it more wound-like. Power comes from a 7.4V hobby Lipo battery plugged into a 5V voltage converter. After ripping a small hole in the back of his t-shirt for the webcam and a large hole in the front for the screen, [Luis] applied the necessary liberal amount of fake blood to finish this clever shotgun blast effect. Hackaday writer [Ryan Fitzpatrick], aka [PlatinumFungi], recently put together this amazing Metroid Power Suit helmet as a prop for a [Mike n Gary], on youtube. How amazing is it? This image is an actual photograph of the helmet! It’s being modeled by [Kelly Johnson], who built a power suit costume for a previous Halloween. But she never made a helmet, which makes sense to us. After all, how are you supposed to talk to anyone while wearing a helmet? Practicality aside, it is a delight to walk through the fabrication process. [Ryan] started with a motorcycle helmet, making paper templates based on images from the game. After he had a reasonable road map for the work that needed to be done he started cutting away the parts which he didn’t need. The ‘beak’ on the front was then fabricated from paperboard, with the fins on the side sculpted from rigid foam. But there’s still a lot of work to be done from that point. Sure, the internal lighting and colored visor are necessary touches, but it’s the paint job and ‘distressing’ steps that make this look so realistic. Looks like we’ve exceeded his bandwidth due to the tons of pictures he had of the process. Check out the video after the break. 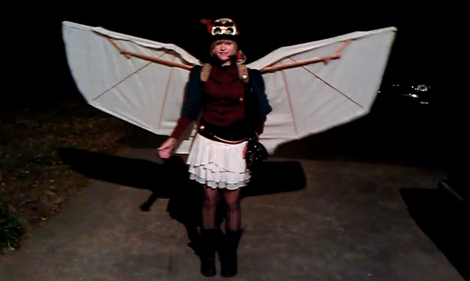 From a small-sized backpack these wings slowly grow to full size in a Steampunk costume that hearkens back to DaVinci flight designs. The mechanism that unfolds the wings was fashioned from parts of a baby gate and an old back massager. The massager features a pair of orbs that are meant to move slowly up and down your back. This is what accounts for the slow unfurling of the wings. After a bit of prototyping with Popsicle sticks [Dannok] and his daughter figured out the best arrangement for the pivoting skeleton. From there, the slats from the baby-gate were used to build the frame, then covered with fabric to finish the wing element for this Halloween costume. A 12 volt gel battery powers the device, which is activated with a brass pull-chain meant for a light fixture. Once full extended, as seen above, the wingspan is eight feet. Don’t miss the pair of videos we’ve embedded after the break which show the workings of the device.